An Air Force Institute of Technology faculty member tries to get a drone to fly during a demonstration for students. Scott Halasz | Greene County News Acey Faulkner, an eighth grader at Bellbrook Middle School, and Jackson Reed, a seventh grader at Xenia Legacy Christian, participate in a hands-on experiment with lasers. 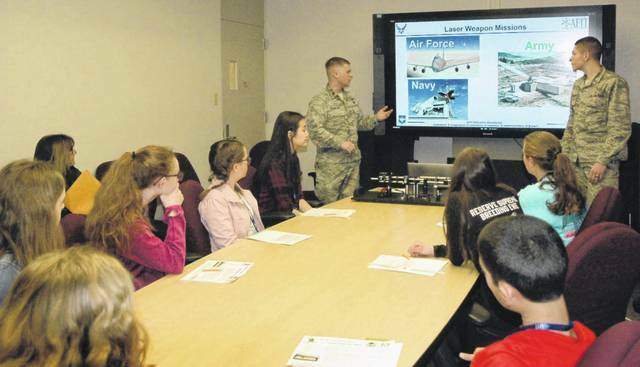 They were among may Dayton area students to visit the Air Force Institute of Technology Monday to learn about STEM fields. Rachel Secody (left) and Kate Bowers, eighth graders at Bellbrook Middle School, draw plans for a straw rocket. The students were tasked with designing, flying, and then refining their rocket. WRIGHT-PATTERSON AIR FORCE BASE — The Air Force Institute of Technology celebrated current engineers and at the same time tried to entice a new generation to consider a STEM discipline. To kick off Engineers Week on base Monday, approximately 200 students from Dayton area schools — including Bellbrook Middle and Legacy Christian — visited AFIT to learn more about what goes on inside the Air Force’s graduate school and try a few things out themselves. The hands-on event featured demonstrations on digital holography, robots and artificial intelligence, high-altitude balloons, building straw rockets, fire science, learning the difference between power and energy on an energy bike, and electricity and magnets. The annual event is seen by AFIT officials as paramount to the future of STEM. The hand-on projects gave students a chance to see and do, not just hear. Bellbrook eighth grader Samantha Goodwin — part of Bellbrook’s Energy Bike team which teachers younger students about energy — chose to participate to help improve her abilities. Legacy seventh grader Jackson Reed was interested in learning more about mechanical engineering but found other things interesting as well. Students also took tours of AFIT laboratories including additive manufacturing (3D printing), wind tunnels, space and environmental labs, and the Autonomy and Navigation Technology (ANT) Center. Engineers Week, part of a nation-wide effort to celebrate and promote engineering, is sponsored by DiscoverE, a coalition of academic, industry, and professional organizations. Universities nation-wide host Engineers Week activities. 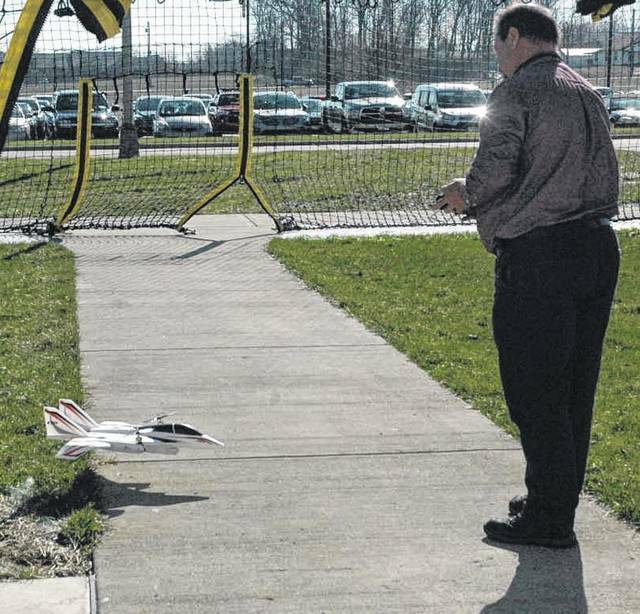 https://www.fairborndailyherald.com/wp-content/uploads/sites/50/2019/04/web1_DSC_6635.jpgAn Air Force Institute of Technology faculty member tries to get a drone to fly during a demonstration for students. https://www.fairborndailyherald.com/wp-content/uploads/sites/50/2019/04/web1_DSC_6642.jpgScott Halasz | Greene County News Acey Faulkner, an eighth grader at Bellbrook Middle School, and Jackson Reed, a seventh grader at Xenia Legacy Christian, participate in a hands-on experiment with lasers. 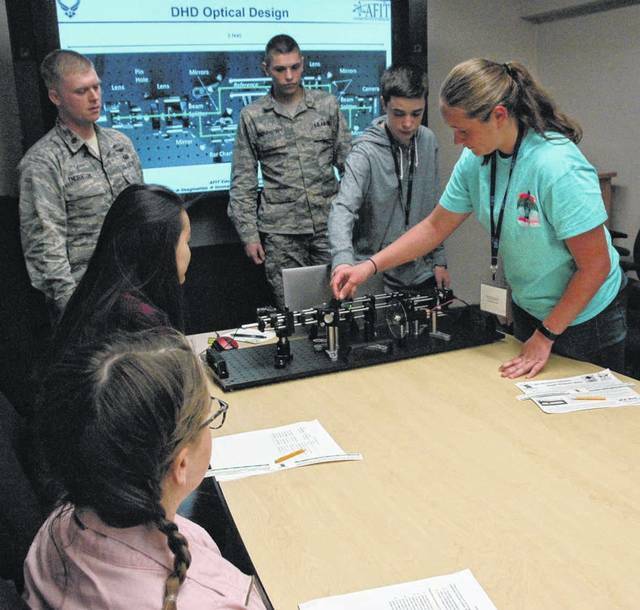 They were among may Dayton area students to visit the Air Force Institute of Technology Monday to learn about STEM fields. 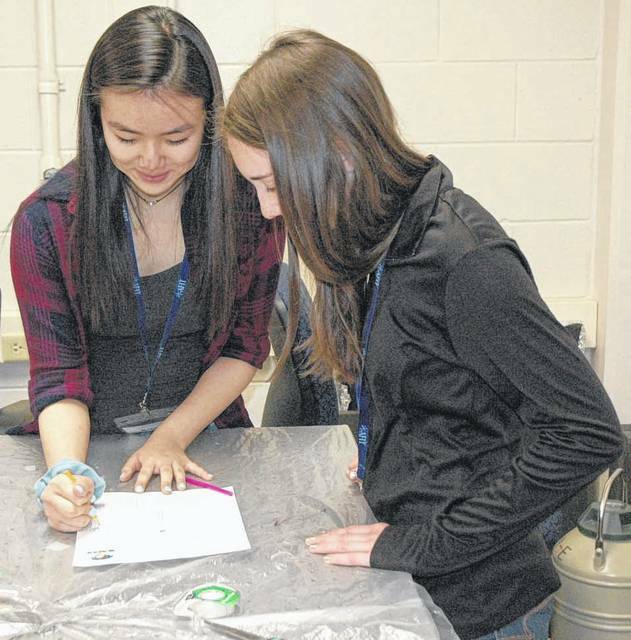 https://www.fairborndailyherald.com/wp-content/uploads/sites/50/2019/04/web1_DSC_6652.jpgRachel Secody (left) and Kate Bowers, eighth graders at Bellbrook Middle School, draw plans for a straw rocket. The students were tasked with designing, flying, and then refining their rocket.